The year 2017 was a monumental year for the Indian telecom industry. No industry in history was ever disrupted at a faster pace and shorter time as was the Indian telecom services industry last year. Mountains fell, earth trembled and giants that roamed a year back went to extinction when a new baby was born on this soil. Reliance Jio, the world’s biggest startup, and India’s richest man Mukesh Ambani’s telecom baby, was born in late 2016. With the launch of Jio services, India’s telecom story was rewritten. The country’s incumbent and biggest operators – Bharti Airtel, Vodafone India and Idea Cellular – were caught unawares, and they were yet to fathom what was there in store for them in the coming times. 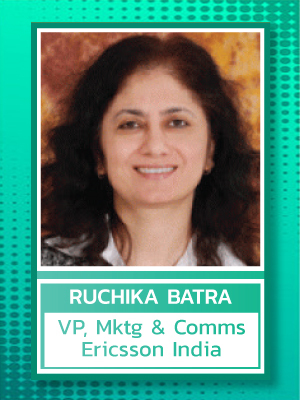 Within just a matter of 12 months, the country that appeared crowded with 12 telecom operators, suddenly shrunk to four, and the deck was reshuffled to make place for the new operator. Many vanished from the market, and the others who survived, started counting days and staring at the same path, unless they do something new, different and absurd. They are forced to revisit their strategies, and, in most cases, follow the newcomer. Reliance Jio was launched in September 2016 and in less than 3 months, the company was able to acquire 50 million customers. The numbers doubled to 100 million within 170 days of it started offering services. And, the average subscriber addition per day was more than 6 lakh. These are astounding numbers, by any measure, to disrupt any industry. When Jio launched Bharti Airtel, country’s largest operator, had a user base of 250 million. At the end of 2017, Airtel’s total subscriber base in India was 280 million and Jio has reached 160 million. What Reliance Jio did in India has never happened anywhere in the world. The operator offered voice calls free for life to its subscribers. This was one master stroke to grab as much customers as possible at a shorter period, and, at the same time, break the ribs of its competitors – by weakening their revenue inflow. The incumbents were still getting 75% of their revenue from voice calls! This was the first disruption. The second disruption was crystal-clear tariff plans. Jio designed its tariff plans that are easy to comprehend and at the same time offer a fixed ARPU to the service provider. For example, by paying Rs.309, Jio offered free voice calls, unlimited SMS and free roaming. This made life easier for customers as users of both type – prepaid as well as postpaid – did not worry calculating their talk-time, cost of SMS or roaming charges – everything was free. On top of that, Jio offered 1 GB of high-speed 4G data per day for the entire month. However, the biggest disruption was offering data services the way and the price that was hitherto unheard of. When Jio launched its services, data cost in India, be it 3G or 4G, was around Rs.250 per 1 GB. Jio, in a single stroke, brought down this price to 30 GB for Rs.300, or around Rs.10 per 1 GB. Indian internet users, till then, were not used to this attitude. Data use was a luxury and a risky affair. You were set for a bill shock if you used data, without fully calculating how much you are consuming, with the prevailing data packages offered by the incumbent operators. That was the reason mobile data, despite having a huge demand, never took off in this country. India’s global ranking in terms of data consumption rose up from 150 a year back to the world’s highest data consuming nation within a year. All because of Reliance Jio. And, Jio just did not disrupt the telecom services, it did the same to mobile phones as well. Despite India being the world’s second-largest smartphone market, there are around 500 million people who are yet to use a smartphone – a phone that can be used for data services. Affordability was the biggest hurdle for these half a billion people to own a smartphone and they were content with a feature phone. Jio wanted to disrupt that as well. In the mid-2017, the firm launched its own 4G feature phone, JioPhone – a phone that looks like a feature phone, with physical key pad and a small display. The phone was priced at Rs.1,500, which, again, will be refunded to the buyer after three years of use. The phone is capable of offering almost all the data-related services. Jio offered all its services – free calls, SMS, roaming, etc – with a recharge of Rs.153, which was subsequently brought down to Rs.49. And as a hallmark, Jio offered 1 GB of 4G data per month to users within this tariff plan. With this, Jio offered the complete package – free call and SMS services, enough data and an affordable smartphone. Customers did not find a reason why not to switch to the new operator. And when they did, it impacted the performance of the incumbent operators that they never expected. Few quarters into Jio’s launch, the incumbents started feeling the heat. India’s largest operator’s net profit went down by 75%, Vodafone’s by over 60% and Idea Cellular posted loss for the first time in its history. Smaller firms, however, could not survive the blow and preferred to shut their business. Others, who did survive, decided to merge their businesses. The firms that closed their operations in 2017 include Videocon, Quadrant, Reliance Communications and Aircel. Reliance Communications or RCom and Aircel, in fact, wanted to merge their businesses. However, all did not go well with their M&A plans. As both these firms were reeling under heavy debt – collectively over Rs.60,000 crore – they, individually, decided to call it a day and closed down operations. The operators that treaded the M&A path include MTS, Augere Wireless, Vodafone, Idea Cellular, Telenor and Tikona. Bharti Airtel became the biggest player to take part in the merger and acquisition activity with acquiring 5 other operators. The firms it acquired include Tikona, Augere, Telenor, Videocon and Tata Teleservices. But the biggest merger was yet to happen. India’s No. 2 and No. 3 operators – Vodafone and Idea Cellular, respectively, also decided to merge their businesses to wade through the tough competition in the market, created because of Jio’s entry. In January 2017, both the firms announced they are in discussions for a possible merger and by the end of the year, almost all formalities were accomplished including acquiring the required the approvals. The only thing pending is the nod from the Department of Telecommunication, and the closure of the deal can be announced in a quarter or so. India, the second-biggest telecom market in the world, with more than one billion subscribers, will now have 3 major private operators – Bharti Airtel, Vodafone-Idea and Reliance Jio – and one PSU operator – BSNL. The other PSU telco, MTNL, operates only in two circles – Delhi and Mumbai. By the end of 2017, India had a total telecom subscriber base of 1.19 billion or 1,190 million. This includes 1,167 million wireless subscribers and 23 million wireline or fixed subscribers. Urban subscribers comprised of 688 million, whereas the same for rural areas stood at 502 million. Overall teledensity of the country touched 92% by the end of the year with urban teledensity at 168% and that of rural was at 57%. India’s total broadband subscriber base reached 363 million by the end of December 2017, of which 345 million were on mobile broadband and 18 million were on fixed broadband network. At the end of December 2017, Bharti Airtel was commanding a market share of 24.85% in terms of total wireless subscriber base, whereas Vodafone was having a share of 18.2%. Idea Cellular and Reliance Jio are placed at third and fourth position, respectively with market shares of 16.83% and 13.71%. BSNL, the only pan-India PSU operator, had a market share of 9.24%. 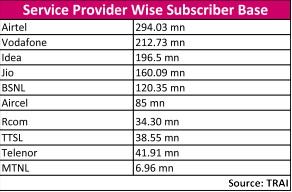 In terms of wireless broadband, Jio holds the highest market share of 44% with 161 million subscribers, whereas Bharti airtel has a market share of 20% with 69 million users, Vodafone with 52 million subscribers hold a market share of 14% and Idea Cellular with a total subscriber base of 35 million has a market share of 10%. 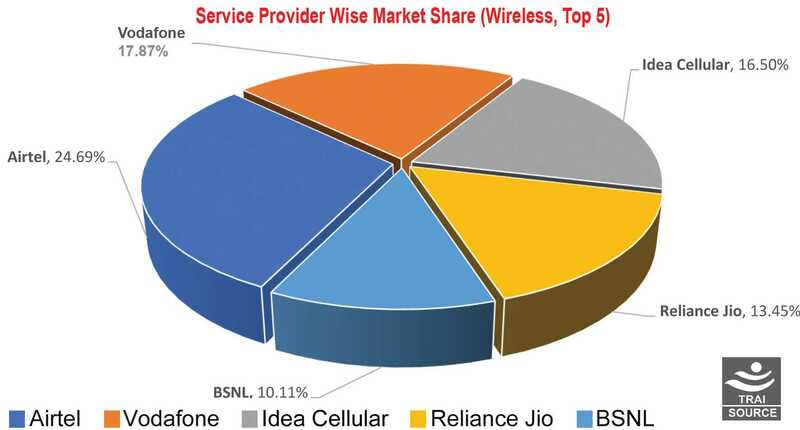 BSNL is the fifth operator with a market share of 6%. The financial health of the industry has become a matter of great concern since the entry of Jio to the business. Jio offered something free that used to account for 75% of the industry’s revenue a year back – voice calls. The ARPU (average revenue per user) has come down to Rs.80 in December 2017 from Rs.117 a year back. The Gross Revenue (GR) and Adjusted Gross Revenue (AGR) of the industry have been on a steady decline since last September. For the December quarter itself, the GR and AGR declined by 8%. Overall, the Indian telecom industry is sitting on a debt pile of Rs.4 lakh crore by the end of December 2017. The impact of Jio’s entry was such that all these incumbent operators – Bharti Airtel, Vodafone India and Idea Cellular – have reported losses in their latest financial results. Ironically, Jio, in its third quarter, has reported profit of Rs.504 crore and is expected to better its financial performance in the fourth quarter. Going forward, in terms of financials, the picture does not seem to look any better in 2018, as Jio will continue to offer free calls and SMS services. The worrisome fact is that other operators have also followed suit and started offering free call services, meaning, revenue from voice calls would be down drastically or, may be nill, in the coming quarters. Competition in data pricing is getting tougher and tougher each day with operators bringing out new tariff plans to outsmart each other. And every time they bring out a new tariff plan, in most cases, it is cheaper than before – and the happiest in the world are the customers. 2018 will also see the final number of operators that would serve the country, most probably four – Airtel, Voda-Idea, Jio and BSNL. 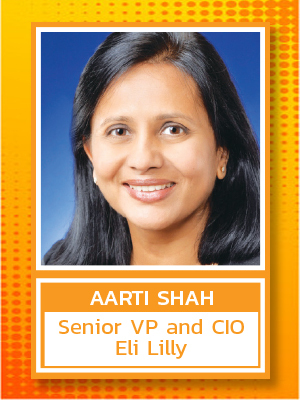 Less number of operators, and saturation in customer acquisition, also mean price of services would go up and ARPU might stabilize in the coming times. This year is also going to be significant as the government is planning to bring out the New Telecom Policy (NTP), 2018 any time during the second or third quarter. The NTP 2018 is expected to define how India should deal with the telecom business in the age of IoT, M2M, Artificial Intelligence and 5G.